or us in the Fraser Valley, it seems like summer is hanging in for the long haul. Certainly nothing to complain about after the June-uary we suffered through. However, autumn is around every corner it would seem. Trees are turning colour, many crops are ready to eat, and there's a distinct chill to the air in the mornings. The busy growth and bounty of summer is drawing to a close and the second harvest is nigh. The nights are growing longer and the Equinox is here. This is a special time celestially, spiritually, and agriculturally. For the second time in the year, day and night are equal. This may not seem like much in the mundane world, but spiritually it is a time of balance and thanksgiving. Within the Wiccan community this time is called Mabon or Second Harvest. We take the time to thank Divinity (in Her many forms and names) for the bounty of the warm months that are behind us and for the food now harvested and stored for the cold months ahead. Celebrations and Feasts abound at this time. Many pagans will bring their families together to share food, stories, and laughs. Fun activities like candle making, corn-dollies, and sing-a-longs can usually keep the kids out of trouble. Time is usually taken to tell the myths of the season and to discuss the turning of the Wheel of the Year. Altars decorated for Mabon might include herbs, flowers, or autumn leaves, nuts, and other nature treasures, apples, and even breads. Magic involving apples, grapes, and gourds are perfect at this time of year. A Blessed Mabon to you! 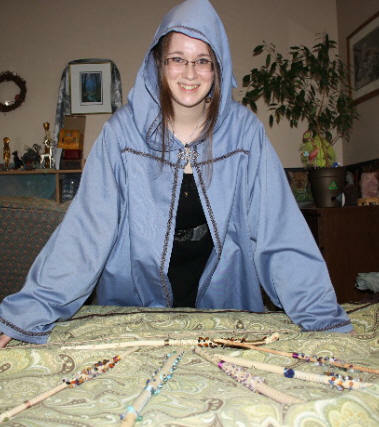 Sorcha Kincaid is a practicing Wiccan High Priestess, a mom and works in Chilliwack. She has been a resident for many years and loves the city and surrounding countryside. Looking for a wand? Sorcha has them! Beautiful, handmade and set with semi-precious gems.